Leaked carrier roadmap documents of unknown age and origin aren't necessarily the most accurate things in the world, but they are one very awesome, important thing: leaked. Pictured above is a fragment of one such spreadsheet that we've had the good fortune of receiving for T-Mobile USA -- obviously it's a little bit on the small slide, but no sweat, we'll walk you through what it's saying. Again, we wouldn't take these dates as the gospel truth, but we'd venture to say they're a good rough guide for what to expect out of these guys for the next few months. Move along for the full list! 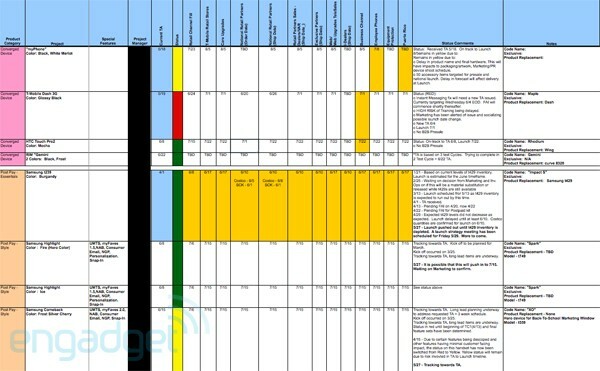 T-Mobile roadmap shows Dell netbooks, BlackBerry Gemini, and more originally appeared on Engadget on Fri, 05 Jun 2009 08:30:00 EST. Please see our terms for use of feeds. Tagged with Dell, T-Mobile, blackberry. June 5, 2009 by Ben Pike.